Recently I got a call from my cousin who is also a recent returnee. Actually, it was more than one call. The first time my phone rang and I saw his name pop up on the screen, I didn’t pick up. It wasn’t personal. I didn’t feel like talking to anyone. I’d had one of those days when you’re just completely spent. The night was still relatively young, but I’d been in my pyjamas since 4:00pm, waiting for an hour that seemed respectable enough for a grown woman to climb into bed and go to sleep. But my cousin—I’ll call him “Clueless Casanova” (C.C.) kept phoning. After the fourth or fifth time, I finally picked up. “Thank God,” C.C. sighed when he heard my voice. “This one, dear, is an emergency.” My heart tightened in my chest. My first thought was that something bad had happened, maybe somebody had died or been badly injured. There was a definite sense of urgency in my cousin’s voice, but his tone didn’t seem to indicate anything so dire. “What’s up?” I wanted to know. “I need you to loan me some money.” Me? Money? Asking me for money is about as futile an effort as walking into a desert in search of a cool drink of water: there simply isn’t any to be had. “Um, okay,” I said. That was an amount I could manage, especially if it was only for 24 hours. C.C. explained, still whispering, that he’d taken his wife—whom I will call “Horrified Epicure” (H.E. )—out to dinner to celebrate her birthday. “Oh,” I said, trying not to laugh. “We didn’t even eat that much,” C.C. complained. “We each had two drinks and a main course.” I wasn’t sure whether he was trying to defend his impoverished state or apportion blame. I asked where they were; C.C. called the name of a popular Chinese restaurant (let’s call it the Forbidden City Café), and that was all I needed to hear. The fact that I don’t cook (that’s don’t, not can’t) has turned me into something of an armchair expert in gastronomy. I’ve had the distinct displeasure of eating at the Forbidden City Café a few times and would never choose to go there again. First off, they’re unnecessarily snooty. They behave as if Confucius himself is sitting at a corner table eating egg rolls and spouting aphorisms. Second, food at the Forbidden City Café is overpriced, which wouldn’t be so hard to swallow if they actually gave you enough to make you feel satisfied. Which brings me to my third issue; they’re stingy with their portions. They will charge you about five cedis for an infant-sized plate of plain white rice, barely enough to carry you through one serving spoon of sauce and a couple pieces of meat. Every time I’ve gone there I’ve found myself holding out my empty plate and saying to the waiter in a meek voice, “Please, sir, I want some more,” as if I were re-enacting a scene from Oliver Twist. I mean, really, the cheek of it! Typically, at a Chinese restaurant you’re supposed to order plenty, eat plenty and leave with plenty, like two or three of those white folded take-away boxes, the ones with wire handles, red-ink drawings of dragons or pagodas on the sides and the words “thank you,” and “enjoy” stamped all around. Not so at the Forbidden City Café. Still, why didn’t you take enough money to handle any unforeseeable events or additional activities?, I wanted to ask my cousin, but I stopped myself before I did because I already knew the answer. I can recall a half-dozen times in the past two months alone that I’d found myself in town without enough cash to make a purchase or payment. Carrying cash is one of those little lifestyle changes that returnees have to force themselves to make. People don’t carry cash in the U.S. or the UK, not like they do here. There’s no need to, not when you can pay for nearly everything with a credit card, including the $3.00 parking fee at the airport and a $1.00 can of soda from a vending machine. 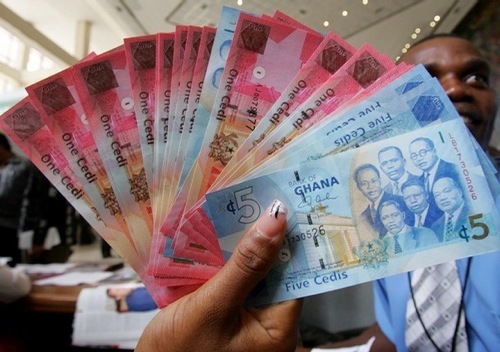 The first time I changed money in Ghana, back when the old currency was still in use, the woman at the forex bureau slid several stacks of bills toward me. I was dumbfounded. The only place I’d ever seen that much money was on television, during bank heists. “How am I supposed to carry all that?” I asked her, looking at my cute-but-suddenly-impractical handbag. She seemed annoyed as she tossed a black polythene bag in my direction. I placed the money in the bag and nervously walked out into the street, the sweat beads rolling furiously down my forehead. I felt exposed, vulnerable, as if I were wearing a sign taped to my back that said, “Please, rob me!” Thankfully, nobody did. Even though the currency has changed and carrying cash is a whole lot easier, I’ve noticed that more often than not what people pull out of their purses and pockets are not wallets but thick wads of cash folded in half. It’s a strange sight coming from the Western world, where the exchange of money is treated like some secretive white-collar transaction, and public displays of cash are thought to be gauche, plebeian, nouveau riche. “Things are changing,” a few people have assured me. “Pretty soon Ghanaians will be using mainly credit and debit cards.” Truth be told, when it comes to that, I’m hoping that things don’t change. I’m finding that I rather prefer the use of cash over credit. I don’t mean to sound like a conspiracy theorist but the problem with credit, and with everything digital, is that you leave a footprint. The more digitised your life, the more banks, corporate entities, hackers and, yes, government agencies can track everything about you: where you shop, what you buy, how much (or little) money you have. And, as I found out during a recent dispute over a supposed tax debt with the U.S. Internal Revenue Service when my funds were levied, they can go into your accounts and either freeze or take your money. (By the way, I won the dispute and the funds were returned.) No such intrusion with cash. As for my cousin, Clueless Casanova, I used his misfortune to my advantage. All that talk about food made me realise I hadn’t eaten since lunch and with the exception of some lettuce and other rabbit food, my fridge was bare (I don’t cook, remember?). “Can you bring me one of their noodle dishes?” I begged. Clueless Casanova left his Horrified Epicure at the restaurant and came to pick up the cash so they could complete their big night on the town. After he left, I pulled out the small Styrofoam take-away pack to find the most meagre serving of noodles, for which I had paid thirty cedis…and not even a fortune cookie! "The View From Here," a column by the author, is featured in the Daily Graphic every Friday. Article may not be republished without written permission from the author.